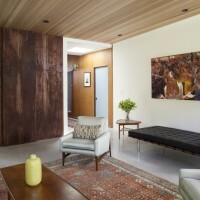 Architect Ana Williamson has completed a contemporary addition to a 1960’s Eichler house located in Menlo Park, California. 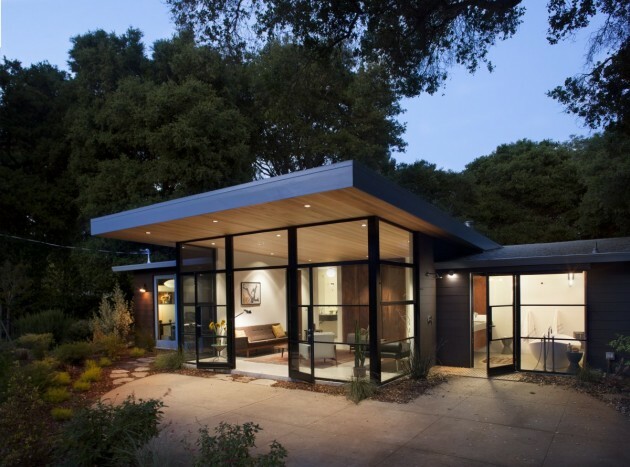 The existing house, a 1960’s Eichler nestled under a thick oak canopy in a Menlo Park neighborhood, was still in its original condition when our client first acquired it 10 years ago. From that time until we met, he entertained several expansion ideas that were inspired by a continuously evolving program. However, his deep affection for midcentury modern design, coupled with a fear of overwhelming the simplicity of the original structure both conspired to stall any tangible progress for most of those 10 years. The initial design objective wasn’t clearly delineated when we started to work together with our client. We generated several preliminary concepts as the scope of the project fluctuated between a minimal remodel approach and a more comprehensive undertaking. Ultimately, after several schematic design explorations, we established a solid program with a clear path to create a direct connection to the backyard that had been previously overlooked. 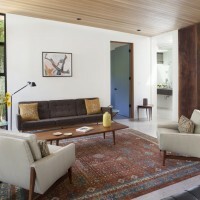 We achieved this deliberate connection by introducing a new Family Room hub which opened the rear (bedroom) area of the house towards the beautiful backyard and its mature oak trees. This gesture is further emphasized by the gently sloping roofline that reaches upward directing the view towards the upper tree canopy and sky. The slim-line steel doors and windows of the addition offer an elegant counterpoint to the traditional wood structure, emphasizing lightness and transparency. The relatively modest 500SF addition radically transformed the original flow of the house, and made it possible to integrate the backyard and pool area with the remainder of the house. 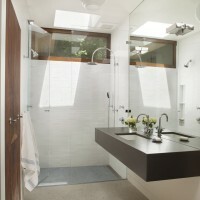 The material palette was kept simple, using concrete floors to match existing, white walls, concrete countertops for bathroom vanities, Heath ceramic tile for the shower walls and reclaimed walnut sliding panels in the family room.